A summit of central African leaders was thrown into disarray when previously unannounced guests crashed the summit. The leaders were shocked to see IMF chief Christine Lagarde, a national of France who had held various ministerial positions in the French government before her current position as IMF chief, and current French Finance Minister, Michel Sapin, joining them. 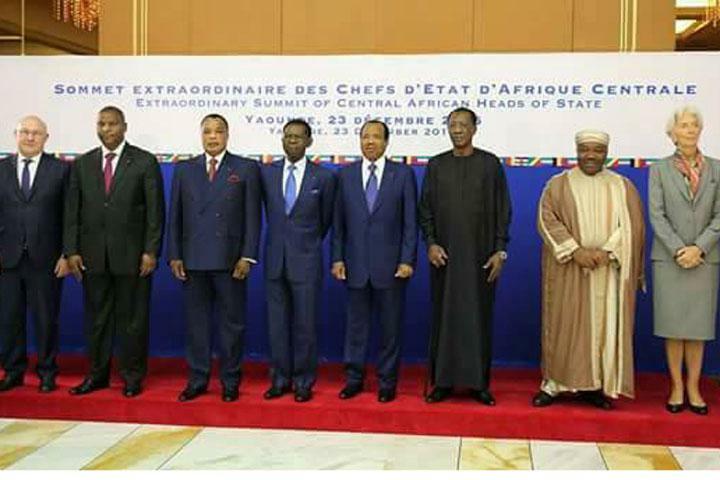 Only the host, Mr. Paul Biya of Cameroun must have been in on this surprise. Of course, he had once described himself as the best student of France. Ostensibly, the meeting was held to discourse the impact the fall of oil prices was having on their reserves, reserves that are held in part at the French treasury. The reason of the stealthy gate-crashing move soon became apparent when suddenly on the table was the issue of devaluation of the Franc CFA, the currency used by these CEMAC countries (Economic and Monetary Community of Central Africa). An acrimonious argument soon ensued with the president of Chad, Mr. Idriss Deby pushing for a complete new currency for the zone devoid of French influence, and the IMF and France together with the “best student of France” toeing the French line of devaluation. It resulted in a walkout of Mr. Deby together with the president of Gabon, Mr. Ali Bongo. The ‘benefits’ which were expected from the use of the CFA franc were only a mirage. Indeed, it has neither promoted regional integration nor economic growth, let alone development! This is why the central argument of this paper is that as long as the issue of monetary sovereignty remains unresolved in accordance with the needs and development priorities of African countries, it is unrealistic to expect actual development in these countries. Money is an essential part of a country’s sovereignty and a key instrument of a state which intends to control its’ development process. A sovereign currency is one of the basic conditions for the formation of a true regional market, without which there can be no sustainable industrialisation process. We know, for example, how the developmental states in South East Asia and South Korea, have used monetary and fiscal policy to promote strategic sectors of their economies, turning them into the ‘Tigers’ and ‘Dragons’ of the global economy. The four principles underlying the operation of the Franc Zone, including the free movement of capital between African countries and France, take away any control by the Central Bank on capital movement within the area and weakens its ability to regulate capital movement between the latter and third countries. This double handicap explains the massive capital flight out of the Franc Zone, which is especially observed during times of political or economic crisis. Given this evidence and the clear reason that the previous devaluation was done for the benefit and the benefit alone of France, the IMF and the European central bank, that the same forces are now back at the table as European economies especially France’s suffer, should send a shiver down the spine of the Franc Zone. France is a leach in Africa. We must break away from this entrapment by any means necessary.